“But everyone else has it.” “If you loved me, you’d get it for me!” When you hear these comments from your kids, it can be tough not to cave. You love your children―don’t you want them to be happy and to fit in? Kristen Welch knows firsthand it’s not that easy. In fact, she’s found out that when you say yes too often, it’s not only hard on your peace of mind and your wallet―it actually puts your kids at long-term risk. In Raising Grateful Kids in an Entitled World, Kristen shares the ups and downs in her own family’s journey of discovering why it’s healthiest not to give their kids everything. Teaching them the difference between “want” and “need” is the first step in the right direction. With many practical tips and anecdotes, she shares how to say the ultimate yes as a family by bringing up faith-filled kids who will love God, serve others, and grow into hardworking, fulfilled, and successful adults. It’s never too late to raise grateful kids. Get ready to cultivate a spirit of genuine appreciation and create a Jesus-centered home in which your kids don’t just say―but mean!―“thank you” for everything they have. I love that she approaches this from a Christian perspective, but it’s valuable to Christians and non-Christians. 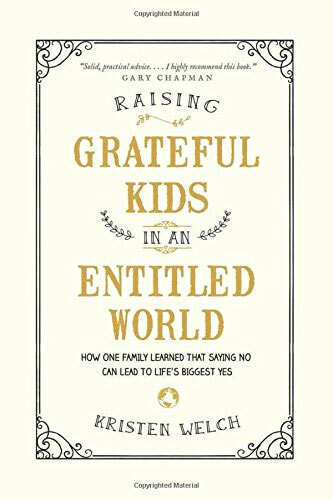 Raising grateful children in today’s world is tough and she gives some practical advice that really works.